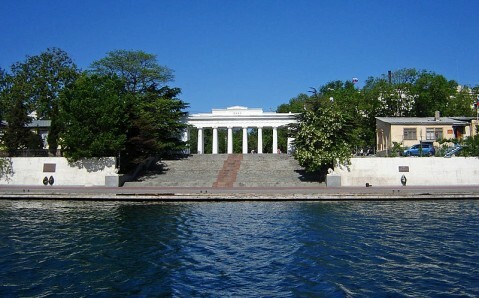 Located at the town's center, the Grafskaya Wharf with granite stairs descending to the sea surface is the main quay of Sevastopol. 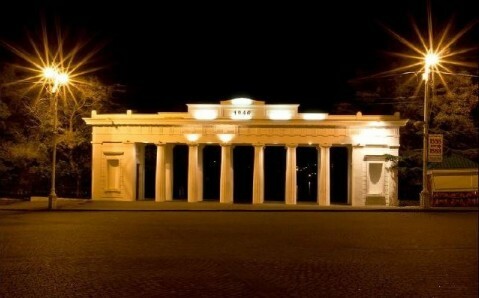 Many important events in town's history are connected with it, and its snow-white colonnade has become a sort of Sevastopol's emblem long ago. The Wharf's history began in 1783 with small wooden quay for boats, which appeared along with the first town's buildings. 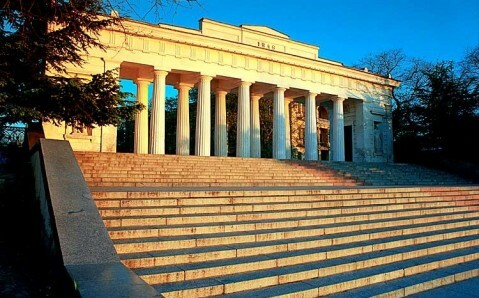 Four years later - on the eve of Empress Catherine's the Great visit to Sevastopol - wooden stairs were replaced with stone ones and the wharf was called Catherine's. This name, however, didn't stick to it. 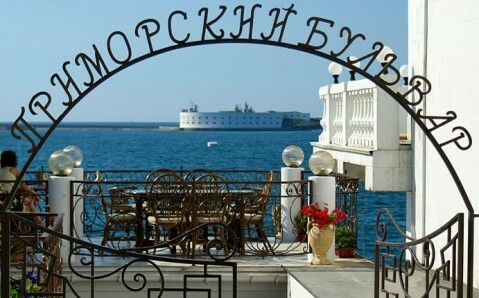 Seamen and town residents often called it Grafskaya (Count's), for Count Marko Voinovich - the then leader of the Black Sea Navy - used to moor here on his boat. In the early 19th century the wharf was decided to be ennobled, and by 1846, it was transformed beyond recognition and turned into the front quay of the military port. 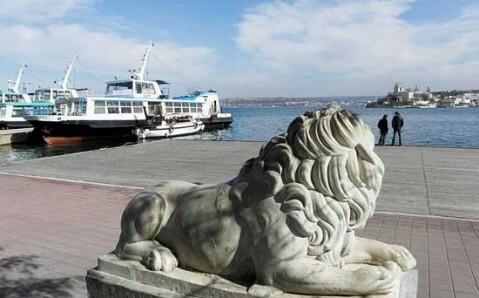 The Grafskaya Wharf acquired broad stairs framed with parapets and decorated with marble lions made by Italian sculptor Ferdinando Pellichio. 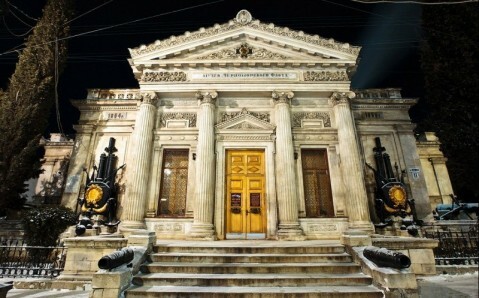 The stairs lead to the white colonnade from Inkermanian stone: two Dorian ranges of columns support strict frieze carried out in Classical style. Four antique statues (just two remained until now) are installed in the colonnade's niches. 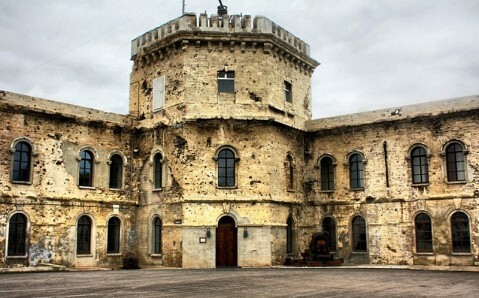 During the first Crimean War and the first siege of Sevastopol supply of all bastions with ammunition and provision, as well as communication between town's defenders and the Northern side were carried out through the Grafskaya Wharf. In august 1855, moored nearby barge with powder was set on fire by enemy's rocket and the Grafskaya Wharf was almost entirely destroyed by powerful explosion. However, the town's main quay was quickly restored from ruins. Several memorial plates, reminding of the important historical events that occurred here in different times, are installed at the wharf. 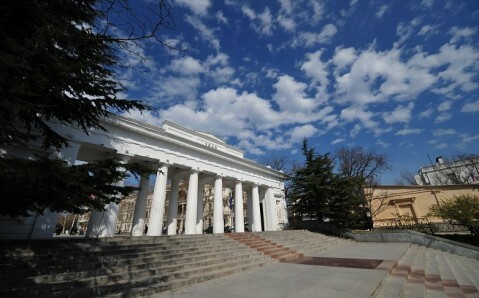 One of them indicates that on November 22, 1853, Sevastopol residents welcomed Vice-Admiral Pavel Nakhimov and Russian marines, who had returned after Sinopska victory, at the Grafskaya Wharf. Another reads that in November 1905, Lieutenant Schmidt departed from this wharf to the cruiser 'Ochakov', where he assumed command over rebelling ships. Today the Grafskaya Wharf is also notable for the fact that the naval review of the Russia's Black Sea Navy and Naval Forces - one of the brightest events in the town's life - starts here every last Sunday of July. 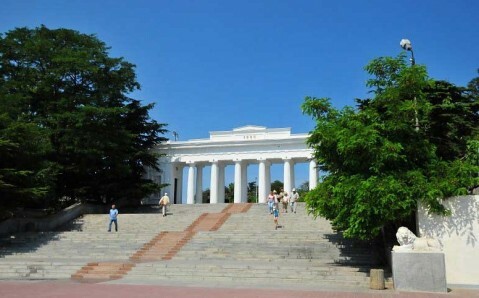 Tourists from different towns and countries come to Sevastopol in order to witness it. Бросьте тут монету в море. Помогает"
Графская пристань - главная пристань города героя. Здесь начинается военно-морской парад кораблей Черноморского флота России и ВМС Украины в День Военно-Морского флота. 1854-1855через пристань проходило снабжение всех бастионов боеприпасами и продовольствием.В1855вражеская ракета подожгла баржу с порохом,стоявшую у пристаниЧто вызвало взрыв и значительные разрушения. Пристань обязана названием графу М.И.Войновичу,командующему Черноморским флотом в 1786. Но официальное название пристани-Екатерининская,и было малоупотребительно.В 1990 вернули историческое название.